Home Slider Precision Air (PW) appoints Sauda Rajab as it's new CEO. Precision Air (PW) appoints Sauda Rajab as it's new CEO. Tanzania's premier airline Precision Air (PW), has announced the appointment of Ms Sauda S. Rajab as the airline's new Group Managing Director & CEO following the expiry of Mr. Alfonse Kioko’s contract. Ms Rajab is taking over Mr Kioko who served the airline in the past 10 years. Mr Kioko himself took over from the first CEO and founder Mr Michael Shirima who as well held the position for 10 years. The new CEO will start her tenure effectively from 1st March 2013. Precision Air's board chairman Mr. Michael Shirima (centre) welcomes the airline's new CEO Ms. Sauda S. Rajab during the press conference. To the right is the incumbent CEO Mr. Alfonse Kioko. 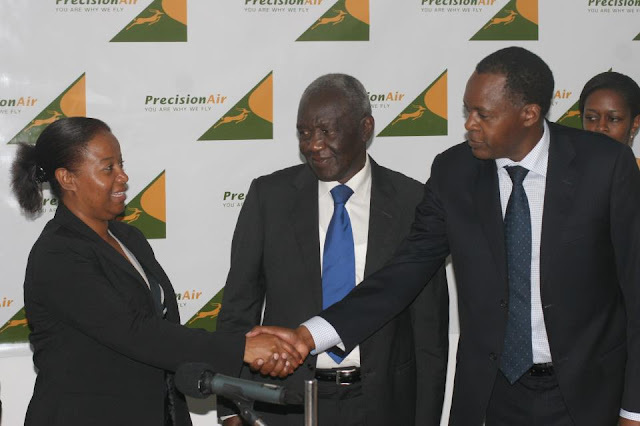 Making the announcement, Precision Air's chairman, Michael Shirima said that, "Sauda is a seasoned airline executive with a proven track record of performance, milestones and integrity. Sauda Rajab (49), who has a total of 23years airline experience mostly in Management at Kenya Airways, joined that airline in 1989 as a Management Trainee. After her training she was posted to the Reservation Department where she rose through the ranks in various roles including; Country Manager – Uganda, Rwanda and Burundi, General Manager Kenya, Area Manager East Africa, Regional General Manager Europe, Americas and Asia and is currently the airlines’ General Manager Cargo Operations. Sauda is a Graduate from the University of Nairobi and is currently pursuing an MBA at the Strathmore University. Sauda’s forte has been to be a change agent, and has brought positive change in all the areas she has worked in Kenya Airways." Mr Shirima further pointed out that, "Mr. Kioko leaves after 10 years at the helm of the Airline in which he steered Precision Air to almost incredible growth and achievements. When he joined in 2003 the fleet consisted of two old ATR 42’s and a few smaller aircrafts but now the airline has 9 new ATR aircrafts (1ATR 42-300, 7ATRs 42-500, 2ATRs 42-600) and 2 Boeings 737-300 bring total fleet currently to 12 which has given leverage to Precision Air being the only Airline in Tanzania to operate the most frequencies and routes regionally. Passenger numbers grew from 200,000 to about million expected this year through a double digit annual percentage growth with Revenues growth from Tshs.20billion in 2004 to Tshs.163billion in 2011/2. Every single year the Company made profits. The company became public owned in 2011. There is no doubt that, coming from outside Precision Air, Sauda Rajab will bring in a new vision and management style to grow the airline amid competition to much greater heights. She has the potential to build on the strong foundation that Mr. Kioko’s team established. She has testified to the huge potential of the airline after a preliminary look around and has committed herself to creating a good share holder value and dividends" he concluded. On her side, Ms Rajab expressed optimism on the airline’s operations pointing out that there are a lot of opportunities from passengers to cargo, and that’s where the target will be. Regarding the stiff competition currently in Tanzanian aviation industry, Ms Rajab said she welcome competition as it enables players to look inwards and make changes that make them deliver better customer services. She said “competition creates new opportunities which were not there at first place. But we have our own niche which is different from budget airlines”. Aviation Tanzania says "Kila la heri" to Ms Sauda Rajab, we hope to see PW propelling to a strong airline hence "the airline of choice".